There must be something in the water in Bray. The sleepy town is home to two of London’s three-Michelin starred restaurants; The Fat Duck and The Waterside Inn. Whether you’re visiting Bray for its pretty riverbanks, charming cottages or just to visit one of its fine dining restaurants – it’s definitely worth an escape from the big smoke. 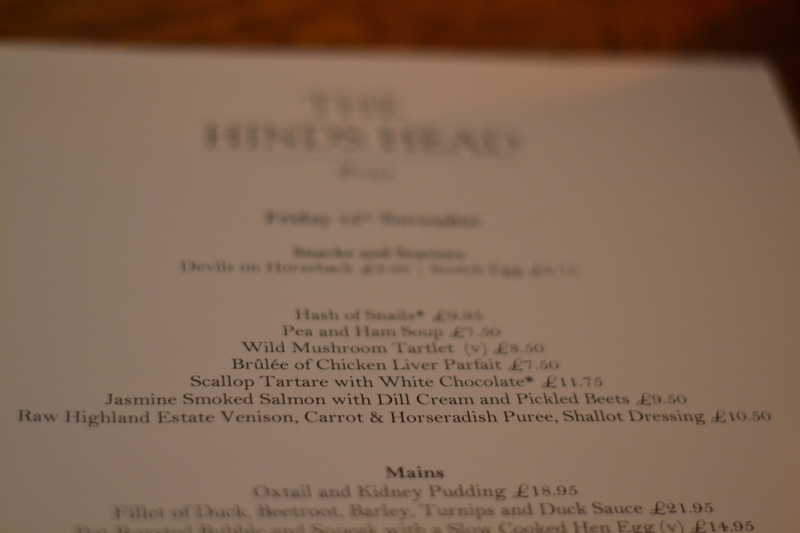 The Hinds Head, owned by Heston Blumenthal is the latest pub in Bray to join the Michelin star clan and really sets the bar when it comes to gastro pub dining. 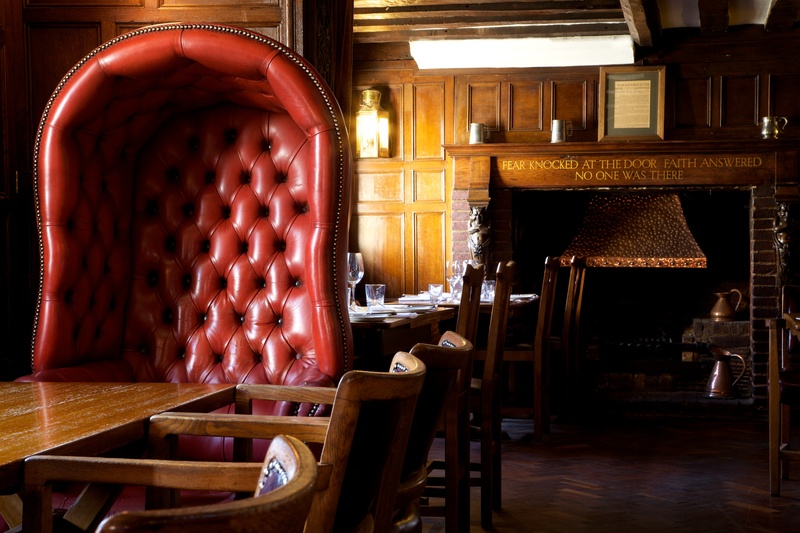 Not surprisingly, the pub has won a number of accolades including ‘The Michelin Pub of the Year’ in 2011 and was awarded a coveted Michelin star in 2013. Upon entering the 15th century pub you feel welcomed immediately by its dimly lit, cosy atmosphere. Locals and visitors alike unite in the front bar, nattering over a lager or two. 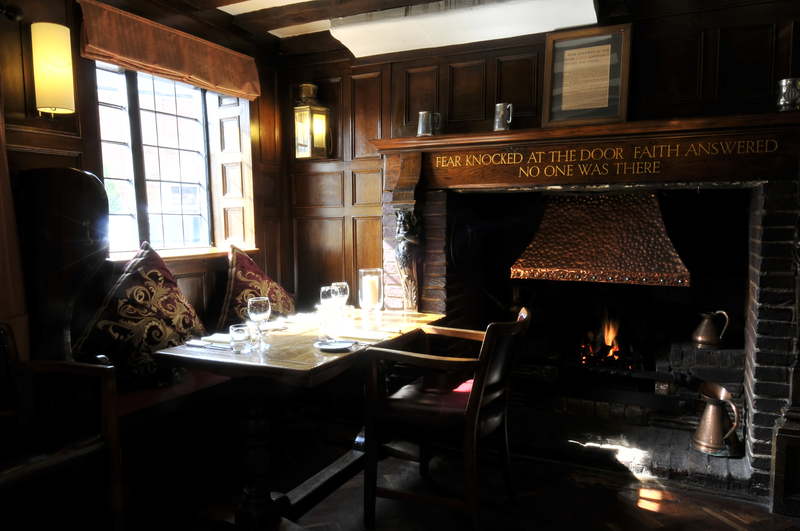 The pub has a unique rustic charm, with its dark wooden panelling, roaring fireplace and low-lying beams. Just watch your head in the dining room upstairs. The menu created by Blumenthal and head chef Kevin Love, is largely inspired by historic recipes taken back from Tudor times. In true Blumenthal fashion, the dishes have a modern twist to ensure they reflect the trends of the day. 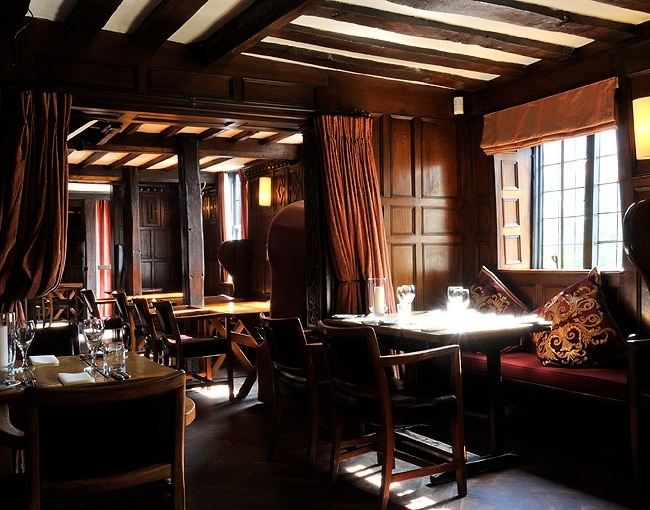 It features a good selection of seasonal cuisine accompanied by traditional British favourites like Oxtail and Kidney Pudding, bubble and squeak and prime rib eye. As well as traditional items, The Hinds Head is also famous for newcomers such as the award-winning scotch egg which is dusted in Panko breadcrumbs and coated with a mustard mayo. 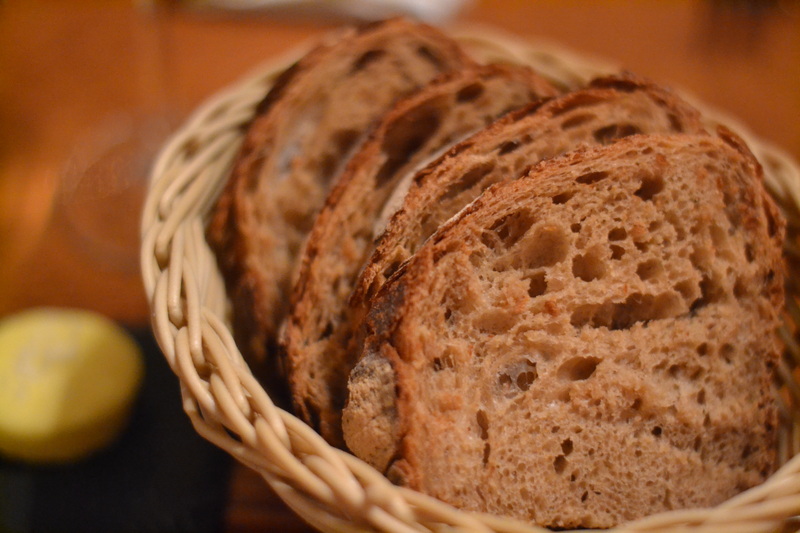 I don’t make a habit of mentioning bread in restaurants but quite simply this bread was out of this world. With a tough outer crust, it had an impossibly delicate and aerated centre. The only issue was trying to stop at one basket. 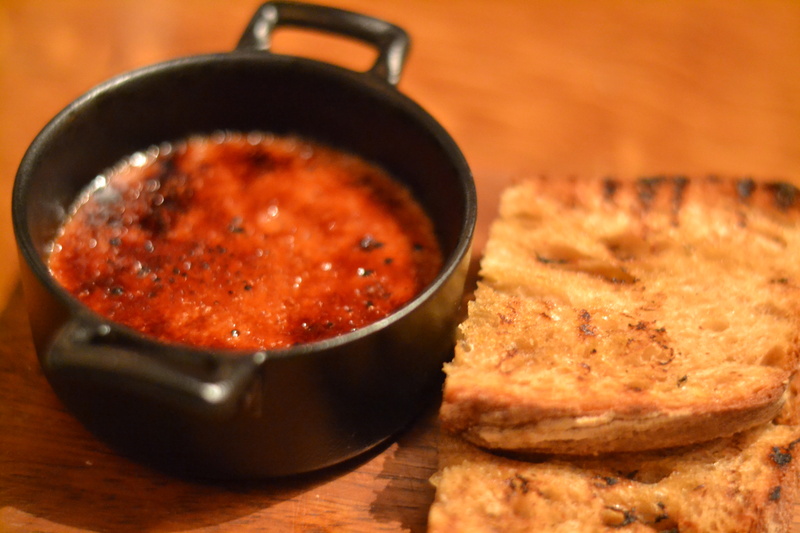 For the starter we shared the Brûlée of Chicken Liver Parfait (£7.50) which was served with toasted sourdough. Cutely presented in a little black ceramic pot, the parfait had a crispy caramelised layer on top which provided a delightful bitter-sweet flavour to the parfait. This is the first savoury brûlée I have tasted and it was a winning formula. The free range pork belly (£21.95) was the winning dish of the evening – crispy on top with a succulent meaty belly underneath. This is one of Love’s favourite dishes, and for good reason! 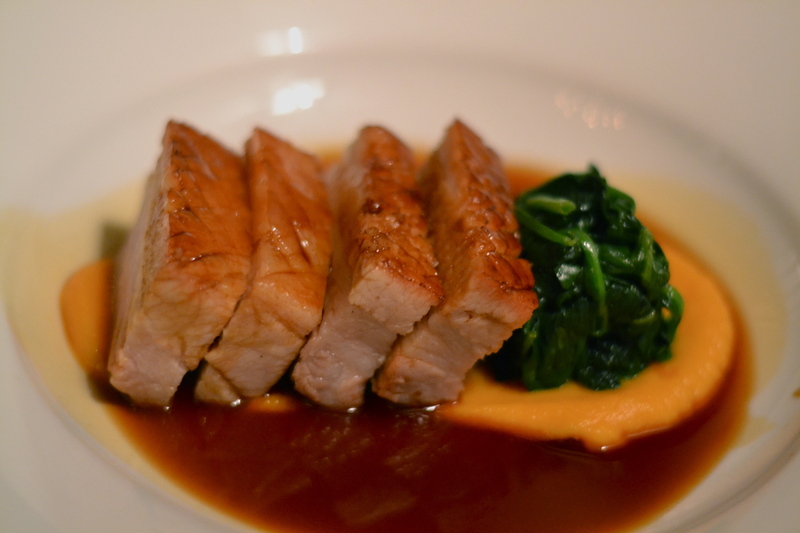 Slices of slow cooked pork belly are served on a simple bed of spinach and puree, with the jus just being enough to give the dish a well rounded flavour. The secret is that the pork is prepared for 26 hours beforehand and then slow cooked for another 30 hours. I won’t be trying this at home! 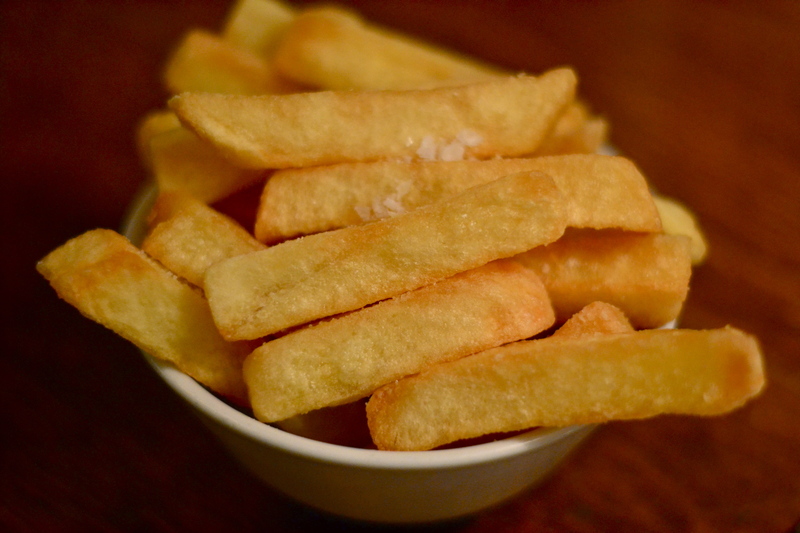 I cannot fault Blumenthal’s formula for triple cooked chips – they are heavenly. Crisp and crunchy on the outside with soft and fluffy potato goodness in the centre, I would be happy to sit down with a big bowl of these and a bottle of red for the evening. So what’s the secret? Apparently they are boiled first in salted water then chilled, cooked in oil, chilled again and finally cooked in very hot oil to make them extra crunchy and finally garnished with a little sea salt. Next was the fillet of duck (£21.95) which was executed beautifully and served with beetroot, barley, turnips and duck sauce. 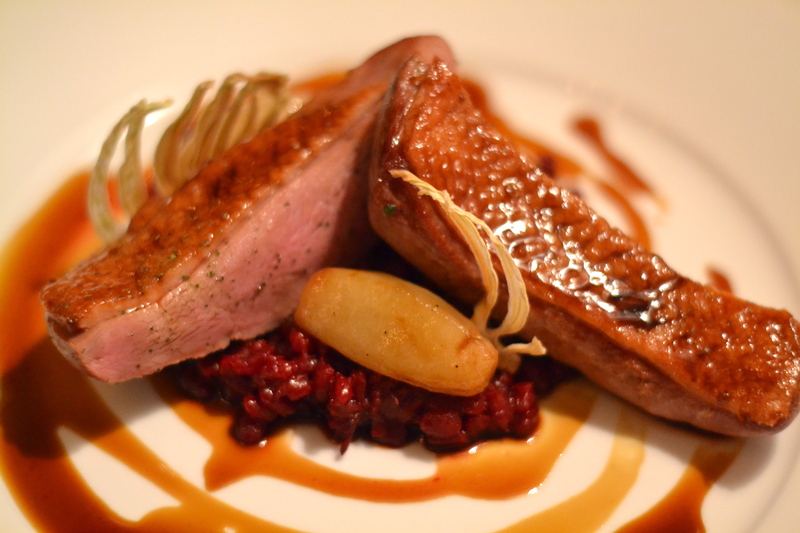 The duck was beautifully cooked with a blush of pink on the centre and a slightly crisp skin. The duck sauce was flavoursome with a delicate, subtle flavour – a perfect accompaniment to the zesty beetroot and barley. 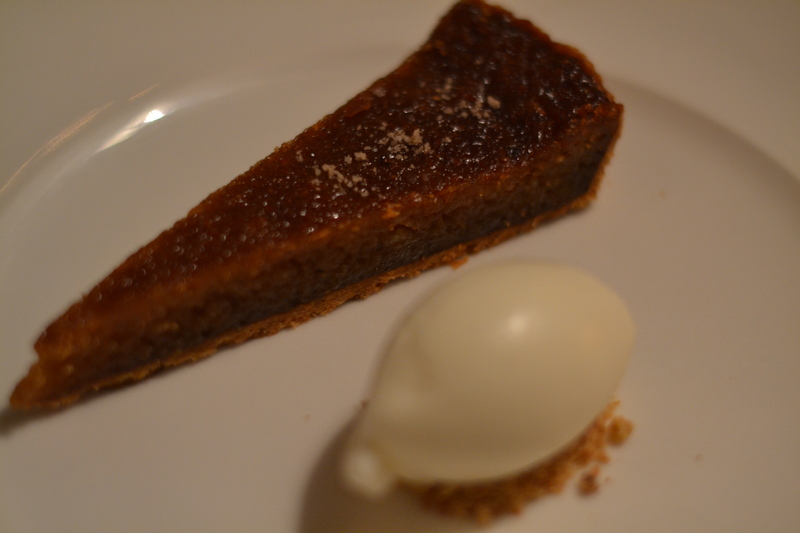 If you are a sweet tooth you can’t go past the Treacle Tart (£7.95). It was everything a tart of this kind should be – sweet, sticky, irresistably rich and screaming with calorific goodness. The small dollop of pure white milk icecream cleansed our palates until we were ready for the next dessert. 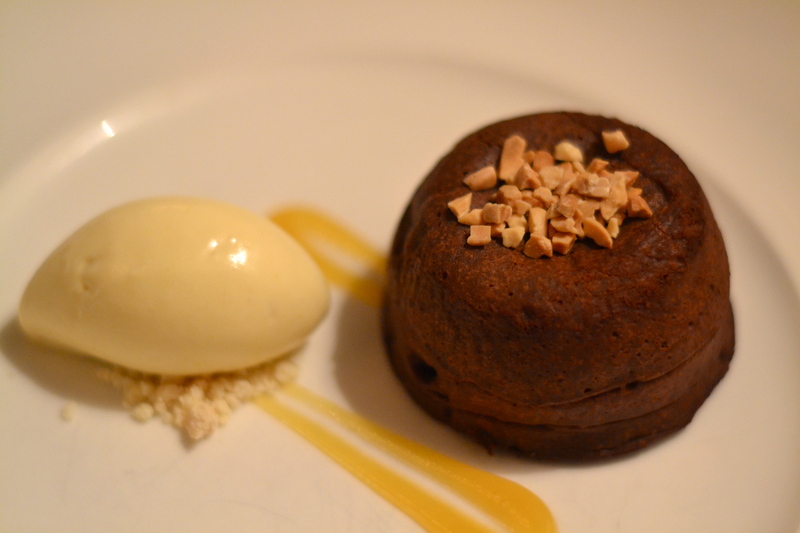 We had to fight over the warm chocolate pudding with orange marmalade ice cream (£7.95) The warm chocolate sponge was filled with a gooey melting chocolate centre. For a bit of added zest, the orange marmalade was laced with Grand Marnier and rested on a small bed of white chocolate soil and orange puree. Blumenthal and Love definitely deliver a winning formula at the Hinds Head – it is definitely some of the best pub food I have ever had. I only wish it was my local! £140 for a starter, main courses and desserts for two including wine and service. Surprisingly, I do like the “at home” look of this restaurant and the food looks scrumptious! I was well impressed by the food, service and everything. 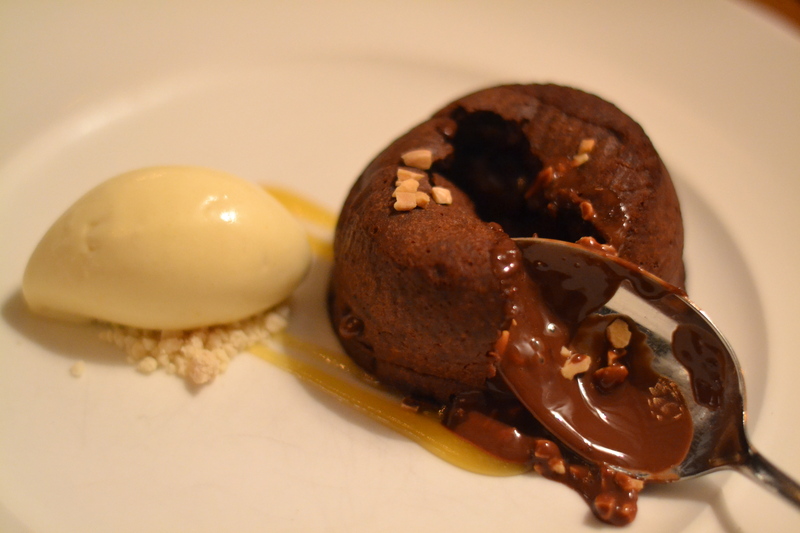 There’s a really good deal for three courses on Time Out at the moment too if you are keen.